It has been 50 years since Martin Luther King Jr., was gunned down. Fifty long years since King was blasted from life on a balcony outside of the Lorraine Motel in Memphis, TN. The years have gone by in a blur for many. Forgetfulness has made King and the Civil Rights Movement a small blurb in history. One has to wonder if the African American community has not wasted King’s sacrifice. King went to Memphis to help the sanitation workers in their quest for better conditions on the job. This was one of the many times King became the focal point to bring light to an issue. Sadly it was to be the last time King would walk the planet breathing. 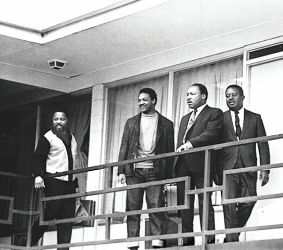 On April 4, 1968 King was assassinated and in many cases the dream he had died with him. Since that day African Americans have become more confused than any previous time in the USA since slavery. When King died the masses of African American people went back to sleep. King’s death became a beacon/ warning to African Americans to follow the status quo while waiting for change. Many people stepped in to take charge of the leadership void King’s death left. From Jessie Jackson to Al Sharpton, men tried to fill the shoes King left vacated. To see the results one only has to look at the news or go into the African American community to realize the level of failure. In 2018 the African American community is still facing the same problems it faced in 1968. The biggest difference is without a King-like leader, people don’t have the leadership to get things changed. This is why you see the same time-worn strategies being used in 2018 from 1968. When King and others marched it was the final use for marches as a method of change. The culmination for the march was the big march on Washington where King electrified the world with his oratory. Every march since then has been in futility. Yet whenever there is a problem African Americans hold a march. King was a master orator. People listen to his speeches in 2018 and get tears in their eyes. Every leader since has attempted to use his words to motivate the African American masses. All these King impersonators have done is create a ball of confusion in the African American community. The divide created from differing viewpoints has kept the chasm of disunity in the African American community growing. Oddly enough these so-called African American leaders have more fame than King could ever imagine. Al Sharpton is a fixture on television and Jessie Jackson ran for president. Yet the African American people still suffer. King was the standard for ministers in the African American community. In 2018 many African American people still look to the minister to speak for them. All this has created is mega churches with very wealthy ministers. Three years ago Creflo Dollar was worth a cool $27 million. We’ll let that sink in. Do you think someone who is making this kind of money wants things to change in the USA? Is it possible that it is time for African Americans to look elsewhere for leadership than the pulpit? King may have his detractors but he died for what he believed in. Was his non-violence concept foolish? Who knows? One thing is for certain; African Americans did not utilize the sacrifice King made to the maximum extent. The schools are filled with African American students who refuse to learn. African American people push drugs and kill one another at an alarming rate. African Americans are still begging for crumbs at every other race’s table. There have been celebrations marking the 50th anniversary of King’s death. People of all cultures celebrate King’s death. Sadly the African American community continues to dishonor King’s life. I wonder how King would feel about the way the African American community has honored his sacrifice.